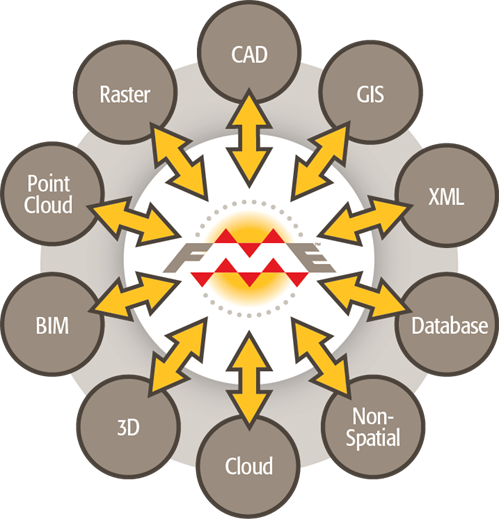 At the heart of FME is an engine that supports an array of data types and data formats; from GIS and CAD to BIM and Point Cloud, via XML, Raster, databases, and many more. The capability to support so many data types is made possible by a rich data model that handles all possible geometry and attribute types. Most importantly, the data translation process is seamless to the user; FME automatically converts between data types as required, and automatically substitutes one attribute or geometry type for another where the destination format does not support it. Attention students! I&apos;m Miss Vector, FME schoolteacher. I&apos;m here to give you tests on what you have learned. I really hope you don&apos;t get these questions wrong! Q) ETL is an acronym for...?